AGCO introduced its new Fendt® IDEALTM combine during the 2018 Canada Farm Progress Show in Regina, Saskatchewan, June 20, 2018. The Fendt IDEAL combine is the first "clean-sheet" design of an axial combine in the industry in 30 years and is the most recent example of Fendt’s tradition of providing ground-breaking technologies and best-in-class customer support. REGINA, Saskatchewan (June 19, 2018) — AGCO Corporation (NYSE:AGCO), a worldwide manufacturer and distributor of agricultural equipment, introduced its new Fendt® IDEALTM combine to Prairie Province producers during the 2018 Canada Farm Progress Show in Regina, Saskatchewan, June 20, 2018. The introduction to producers, dealers and media was the combine's first public appearance in North America. The Fendt IDEAL combine is the first "clean-sheet" design of an axial combine in the industry in 30 years. "The IDEAL combine is part of the Fendt family in North America because Fendt products are the most productive and technologically advanced in the agricultural industry, with best-in-class customer support," says Robert Crain, senior vice president and general manager, Americas. "Fendt has been known for ground-breaking technological developments since the 1930s. The Fendt IDEAL combine is the most recent example of this tradition because it is a game changer in the combine industry. No one has the features and the productivity that this combine has." Fendt IDEAL combine customers will take advantage of superior aftersales service via the Fendt Gold Star Customer Care Plan. 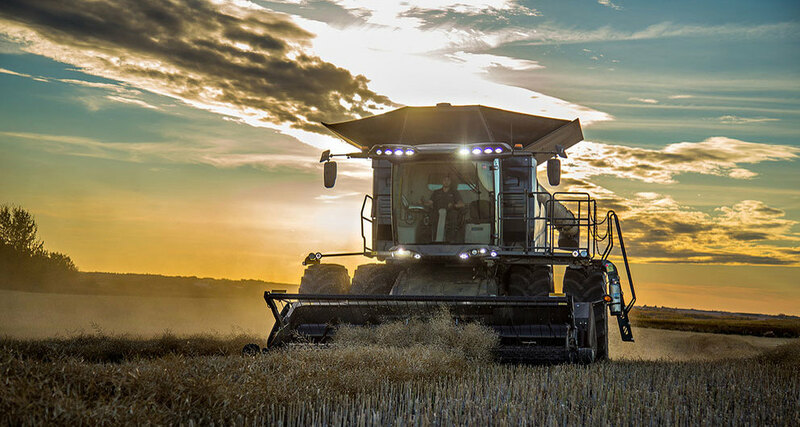 "With a global design team working together, AGCO created the Fendt IDEAL combine based on what producers around the world told us they needed most – in-field efficiency, unrelenting uptime, radically simple operation and better grain quality – to harvest their crops," says Caleb Schleder, tactical marketing manager for combines. "The Fendt IDEAL has gone through seven years of the most vigorous testing and been proven in what we call the ‘corner' conditions, the most extreme conditions in a variety of global crops." The combine will be available in Class 7, 8 and 9, providing the right capacity to maximize harvest for all operations. Headers featured for small grains and canola include the 9255 DynaFlex™ draper head available in 25-, 30-, 35- and 40-foot models and the 15-foot 4300 pick up head. Additionally, the CommandTM Series corn head will be compatible with the Fendt IDEAL combine. The Fendt IDEAL combine sets a new standard for harvesting automation that makes operation easier, optimizes machine performance and ensures top grain quality. Equipped with the IDEALharvestTM system, these machines offer real-time visualization of crop flow inside the combine using a special grain-quality camera. A combination of specialized sensors determines what is grain and what is not and directs the IDEALharvest system to change the combine settings to achieve the operator's pre-set harvest strategy. "The Fendt IDEAL combine automatically makes on-the-go adjustments to maintain established harvesting parameters, which reduces the effort of the operator as conditions change throughout the day," says Schleder. Several new features on the Fendt IDEAL combine help producers optimize grain harvested and deliver cleaner, high quality grain, lowering the potential for costly deductions. The larger, redesigned rotor on the Fendt IDEAL combine is gentler on both the crop and straw. The new dual helix processor is 24 inches in diameter and nearly 16 feet long, almost 2 feet longer than the competition, which allows the materials to generate huge centrifugal force at a much lower speed and remain in the rotor for longer. The helix arrangement of the separation tines and the tine concaves ensures exceptional threshing results and grains are separated gently while the straw quality is maintained. In addition, this dual helix processor design allows the combine to operate at a slower speed, requiring less power to operate. With the industry's largest grain tank at 485 bushels and the innovative IDEAL StreamerTM 6.0 auger, which boasts the industry's fastest unloading rate at 6.0 bu./second, growers will spend less time unloading grain and more time harvesting. The Streamer 6.0 is standard on the class 9 and optional on class 7 and 8. The available Streamer 4.0 unloads at 4 bu./second. Both are gentle on grain and require less power than older auger systems. "Producers interviewed always asked for more uptime, so that is a focus of the Fendt IDEAL combine. Fendt IDEAL combines will fall under the Fendt Gold Star Customer Care Plan," Schleder explains. "The Gold Star Plan keeps overall costs firmly under control giving growers better value and more uptime. The Fendt IDEAL will offer an enhanced service/warranty package which includes 24-hour uptime assurance to ensure all IDEAL owners have maximum uptime during the critical harvest window." The Fendt IDEAL combine also offers the full suite of AGCO Fuse® precision farming technology solutions to bring crop production decisions full circle from planning, field prep and planting through crop care to harvest and storage. "The Fendt IDEAL combine offers many features and technologies that continue AGCO's efforts to help producers maximize their productivity and their efficiency in the field," says Schleder. 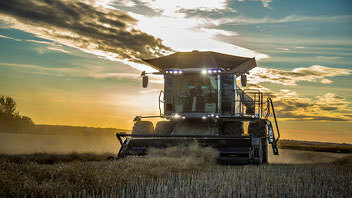 "Field testing for Fendt IDEAL combines has been integral in the launch of this machine, and as we look towards the future with more advancements in the harvesting space, we will continue field testing in all regions globally to ensure the best product for our customers in their conditions," says Schleder. To learn more about the Fendt IDEAL combine or for customers interested in applying to be an IDEAL Elite customer to be eligible for product demonstrations, visit IDEALHarvesting.com. ©2018 AGCO Corporation. Fendt, DynaFlex and Fuse are registered trademarks of AGCO. IDEAL, IDEALharvest, IDEAL Balance, IDEAL Streamer, Fuse and Command are trademarks of AGCO.